Here's a copy of the letter I sent to the editor of Sonoma West Times & News, in protest of the yellow journalism (full of mistruths, nasty, provocative) of their front page article this week, Dec. 25, re Dan Smith, a key figure in the rebirth of Palm Drive Hospital. If you agree with me, please do send your comments to the Sonoma West, as well! This kind of ugly attack is not good for the health of our community, or the creation of Sonoma West Medical Center, which hopefully will open in April '15. I am shocked and disgusted at your paper’s attempt to publicly flog, discredit and humiliate an important and highly valued member of the Sebastopol community, Dan Smith. The article in the Dec. 25 ’14 issue is not only mean spirited, but full of nasty innuendo, half-truths, lies, and probably reflects your own extreme dislike of this man - or you’d have never allowed such an article to be published in your paper. This ugly article was also written obviously with the attempt to set back the formation of the new hospital proposed by the Foundation, Sonoma West Medical Center. As a hypnotherapist, I recognize your use of negative suggestion that it’s not wise to donate funds to SWMC (with the implicit idea that it won’t then have the financial backing needed to open it’s doors.). Your comments about various previous financial donors withdrawing donations to SWMC are nearly all from “anonymous” voices - is Dan Smith so dangerous, really, that many folks don’t dare state their names? Get real! Don’t you realize that by trashing one of the main people that is helping bring about the rebirth of our Sebastopol hospital - and emergency room - you are harming our whole community? Isn’t it time to let go of your anger at this man and start supporting SWMC? God knows we need this hospital, as many locals, medical people, police and firemen have repeatedly testified. It’s time to let go of the “sour grapes” attitude reflected in your paper in article after article. It’s time for the Sonoma West Times and News to become a force of good in the community, rather than poisoning the well of public opinion against a powerful but very kind man and the hospital he’s helping create. As noted earlier, the latest issue of the Sonoma West contains an unusual lead article for a weekly local newspaper that ostensibly supports the interest of the community it serves. The front page article titled, “Sparks Fly around hospital’s major benefactor,” is newspaper publisher Rollie Atkinson's Christmas day culmination of a misleading, months-long vendetta against software entrepreneur and philanthropist Dan Smith. Smith’s purported offense? Expressing strong opinions in his dogged volunteer pursuit of reopening Sebastopol’s Palm Drive Hospital with a life saving emergency room. Atkinson’s article, noticeably devoid of news, skewers the truth by repeating one sour grapes anti-Smith “bully” allegation after another. These charges of "bullying" are being made by the same former and current Palm Drive District Board members who, for the past four years, have grossly mismanaged the finances of the hospital and then voted, secretly in violation of the state’s Brown Act, to suddenly close Palm Drive Hospital last April. The very same elected Board members who rejected repeated admonitions by Dan Smith and other hospital system experts four years ago (see here) to address the declining finances of Palm Drive, and instead literally dismantled the hospital’s expert Financial Advisory Board for complaining too much about management’s financial performance. During the past eight months, as I have reported on, and then advocated for, the hospital’s reopening, what has been most astonishing has been the lengths to which the politically powerful opponents of reopening an emergency room have gone to discredit, diminish, undermine and attack the effort that Dan Smith has led to restore Palm Drive Hospital. One would think that Smith would be cast as a hero by our local newspaper, and by the politicians that we elect to represent us. After all, he has spent literally years of uncompensated hard work, and donated millions of dollars, while twice saving and operating our award winning, much loved local hospital during the past 15 years. Instead, the Campaign to vilify Smith and diminish his effort to keep the hospital open last April (and, since then, to reopen it as the Sonoma West Medical Center in four months) has defined the tenor of both Sebastopol’s City Council, its leading political power brokers Helen Shane and Craig Litwin, and the former Palm Drive District Health Board Chair Nancy Dobbs (who is also the powerful CEO of KRCB Public Media). At the April 26 meeting in to decide upon a Foundation Plan that would have allowed the hospital to remain open with $1.5 million in donations from Smith and his activist wife Joan Marler, under the management of the Palm Drive Health Care Foundation (which has successfully operated the hospital in the past), Nancy Dobbs spoke vehemently against Smith’s plan. Dobbs accused Smith of having large conflicts of interest because he owns a hospital software company and plans to donate software and support services. to a new hospital. She then led the vote to instead close the hospital for the first time in 70 years, and turn away the Foundation plan, as well as the hundreds of her sick neighbors who had relied upon Palm Drive’s emergency room for decades. Atkinson’s newspaper could not be bothered to print any details of the actual proposal, or quotes from its hundreds of supporters in the community Instead, the Sonoma West chose to run a commentary by Jim Horn about why the Foundation plan was financially challenged. Horn was described as a member of the committee that reviewed the Foundation plan on behalf of the District Board. Horn scored the proposal as unacceptable and he takes the only column in that week's newspaper to describe why the plan would never be viable. What the Sonoma West conveniently failed to report was that two other far more experienced local health care experts (current Board Chair Jim Maresca and John Moisle) also reviewed the same Foundation plan, found it viable, and recommended that the Board accept it and keep Palm Drive open. News of this other recommendation never made it into the pages of the Sonoma West. For the remainder of the year, Atkinson’s Sonoma West continued its campaign of deceit against Dan Smith, the Palm Drive Health Care Foundation, and any prospects of reopening the hospital. Scarcely a word was whispered in the news sections about the hundreds of jobs lost when Sebastopol’s largest employer shut down, or the largest public health service crisis in modern history, with hundreds of seniors and children and parents and other West County residents suffering (and a few dying) due to the longer drive and far longer wait times and less personal service at big city Santa Rosa hospitals. This "bigger story" last month never materialized. Because it was not a story at all. In fact, as I reported here last May, the bankruptcy court has no direct approval power over how parcel tax funds are to be spent (check out the U.S. bankruptcy Court's info page explaining this here). And now we have the latest issue’s absurd attack. With the intention, it would seem, to dissuade donors from joining Dan Smith and Joan Marler and hundreds of us who are now writing checks to help get our emergency room back. Atkinson basically blames Smith for not having additional millions to put into the project, and for "frightening" donors through his involvement. As though Smith is the only person in West County who bears responsibility for contributing to an actual solution that restores an emergency room. As though Smith was somehow responsible for the inaccurate notice, absence of financial planning, inaccurate reporting and lax oversight that led to a hospital closing so unexpected that Palm Drive and to get special dispensation to close in less than 30 days, instead of the 90 days required by law before closing an emergency room. It is a lot to ask a small weekly newspaper to always get its facts straight, or to to provide the hours it takes to fully and insightfully report on a story as important and complex as why Palm Drive Hospital closed--and what will take to successfully reopen it. But it is not too much to expect our community newspaper and its publisher to share a page from the universal medical oath, and at least do no harm. Last edited by Barry; 01-06-2015 at 05:00 PM. I was sorry to see Sonoma West's attack piece on Dan Smith. It was largely the complaints of the losers of the Palm Drive Health Care District election. The election is over and the supporters of Dan Smith's plan to re-open the hospital have won. They now have the very daunting task of actually re-opening the hospital. They face long odds and steep challenges. There have been many complaints about how Dan Smith tries to manage Palm Drive over the years, and for all I know some, if not all, may be well founded. However we have now chosen the path of re-opening the hospital. I hope the whole community, including the many respected community leaders that were against this plan, can put aside their various concerns, valid as they may be, and let Dan Smith have an unfettered shot at it, especially since he's putting up millions of his own dollars to enable it. If he doesn't manage to re-open the hospital, you can say we told you so. But if he does, he's our hero and deserves our support and gratitude. The canary in the mine in this case is Dan's hand picked CEO, Ray Hino. I was very impressed by him. While he is still on board then we have a fighting chance. If he should leave for any reason, then there is trouble in River City and there is reason to be skeptical. But for now, let's give Dan and his team all our support and best wishes as they try to pull off this herculean task for our benefit! As a subscriber, I urge the editor of Sonoma West to review your recent front-page coverage of the Palm Drive situation, both current and past issues. In my view, it verges dangerously close to propaganda. It’s written as investigative reporting, but its intention seems to be — at least to me — to discredit the reopening Palm Drive on any basis. One example of many: In the most recent article, you quote a claim of “he tried to get me fired.” In a later paragraph, two people receiving the phone calls denied the “firing” charge. Why then quote an unsupported assertion? Any small-town issue, spun out over the years, elicits very strong, very personal disputes. With assiduous digging, one may readily find a dozen angry souls to be quoted against any activist. (And activism of any sort may involve pushiness, abrasiveness, aggression — sometimes self-defeating, sometimes effective.) But that’s not news: that’s gossip. To aggregate personal charges against one man by people who’ve opposed his actions is valid journalism to the degree that (a) the charges are supported, (b) the actions are illegal, or (c) they’re relevant to the larger issue. I doubt the first two; and as far as I can see, the “relevance” here is solely what’s helped or hindered the reopening of Palm Drive. The case against this man on that score seems to be that (a) several potential donors don’t like him and (b) he’s opposed other alternatives. Well, as a non-profit manager for the past forty years, I can name you many past donors who stopped giving. Probably some of those didn’t like our work, felt we were going astray, or thought I was a nut. But that’s par for the course. If the P.D. fundraising effort is actually failing, that’s news. If some donors are declining to give, that’s no news. As to “other alternatives,” I’d very much appreciate Sonoma West reporting on these in the same depth as has been devoted to predicting (and, in my view, promoting) the failure of the current proposals. To name one man as “at the center of the controversy” feels to me an attempt to discredit the effort itself. If that’s the intention, put it on the editorial page and focus reportage on the concrete issues and alternatives: the fire, not the smoke and the sparks. This story is not about heroes or villains but whether we will accept failure as our only option. It is not about Dan Smith, Nancy Dobbs, or Frank Mayhew, it is about all of us as an entire community. It is about working together to achieve something new and remarkable instead of wallowing in our failure. I was asked tonight why I am so focused about opening our hospital. She drove herself to Palm Drive believing she was having severe gastric pain. By the time she got there, she was passing out from blood loss and was only saved by the quick action of the ER team. If she had tried to drive to Santa Rosa, she would have never made it past Llano Road. She later wrote Joan and I a very sweet note thanking us for keeping the hospital open and saving her life. For her and all the people like her, we must not accept failure as our only option. Well at least Jonathan Greenberg, an excellent reporter himself, has the wherewithal to call the local West County paper on its shoddy reporting of a complex situation that should have been focused on the re-opening effort, not on the people and their personal vendettas. If Dan Smith's efforts are supported by at least a faction of people in town, then why aren't they in the article? Also, it seems like the piece as written is potentially libelous, as it includes pretty vicious attacks on Smith's character, with at least three by 'anonymous' sources. I surmise that this is what happens when the reporter owns not only the paper he's writing for, but has no intention of presenting the hospital politics with any objectivity whatsoever. This is ethically irresponsible journalism. Well, this article did it; I'm cancelling my subscription, and I'll let the editors know why. Last edited by Barry; 01-01-2015 at 12:05 PM. Entrepreneurial, fast moving people with a passion can be scary - make really good things happen but appear dangerous. I've known many - Have you? They play hard. So many blessed people have contributed their time to PDH, sometimes succeeding (#5 in the country per C/R), sometimes not. If they would only stay the game, come back, support SWMC, contribute in any way they can, welcome the new players then something magic, real Sebastopol, will happen. How about you? Last edited by Barry; 01-01-2015 at 12:04 PM. An email I received this morning is below. I took out the names because it was sent to me privately. It occurred to me that maybe the problem is that Rollie and friends just aren't aware of these stories. I can't help but think if they heard from the people who have been saved over the many years and of the suffering of the families of those who have died because our hospital is closed that they would want to work even harder than I to open our hospital. We need to touch their hearts in the same way that ours have been touched. there are perhaps many stories about why the hospital must be open. Another very compelling one occurred 2 days before the hospital was closed, when a Fircrest MH Park senior resident *60 years young* felt strange, drove herself to Palm drive, died on the table, was revived, then had surgery to insert a device that will prevent this from happening again. [She] would not be with us had the hospital been closed, she would NOT have survived a drive thru Santa Rosa. I have to say that (in all these negative news (tidbits) I don’t perceive Dan Smith as a “Bully.” Dan’s goal here is admirable. He put his own money where his mouth (heart) is. If nothing more, he is passionate about this worthwhile effort. (To spend $2 mil. Of his own money) and to work tirelessly for the greater good of the community are all benchmarks of a caring person. To label Dan Smith (as a Bully) is (imho) is only said by envious people who wished they had done as much work as he has. (In all the accounts I have read,) Dan qualifies as a “passionate” person and not a bully by any means. I have always felt that having this hospital here is an asset and can and will save minutes off of transports further inland. Having a Medical Center in Sebastopol is a great service to those from Jenner, (on the coast), to Guerneville, and along that corridor of Sonoma West. I support and salute you. Keep fighting the good fight for the benefit of our larger community! Last edited by Barry; 01-02-2015 at 12:28 PM. You have to wonder now about Rollie Atkinson's motivations. Who gains financially if the hospital stays closed. Rumor has it that Well Fargo is involved and that Rollie is part of that picture. Can anyone shed light on this? Last edited by Barry; 01-03-2015 at 01:12 PM. Position the hospital for a quick and easy closure, including assisting with employee communications. Before the announcement, the district also signed a contract with Huron, a consulting company to provide assistance in closing the hospital. The Huron people helped craft a plan to close the hospital, get through bankruptcy and have $2 million a year to spend on whatever programs the directors wanted. Sound nice? What this makes clear is that there was already a plan to use the parcel tax for something/anything other than the hospital before the district board told the public that they were planning to close. It has never been made clear what this might be although there have been many actions that show that they wanted to spend the money on other programs, even as recently as last week in the Sonoma West when Sandra Bodley complained that I was keeping the board from doing other programs. One does not have to look far to see what other medical programs there are in west county and $2 million a year is a LOT of money to pass around so you can see that this looked like a very attractive alternative to running a difficult hospital. In my view, this has been why the district board did not want to consider options to keep the hospital operating or reopen it, it just looked too sweet to administer a big pile of money with no obligations to provide emergency and acute care and their consultants had convinced them that they had no obligation to do so nor that the hospital could be made viable. I doubt that Rollie has any involvement in any of this other than personal relationships that might sway his opinion in one way or the other. However, his personal bias is writ large in his articles about the hospital. That being said, we know people who would be likely recipients of tax money if the hospital was kept closed and no surprise, they have lobbied against reopening it. Last edited by Barry; 01-03-2015 at 01:16 PM. I didn't read Rollie's article nor do I follow the Palm Drive saga closely. However, when I read the pro-hospital comments there is a fair bit of wishful thinking and lots of fantasy. Don't get me wrong. I'd like to see the hospital open and Dan Smith can spend his money how he wants to. Wishful thinking, fantasy, and Smith's money will not save a hospital. When I was a Supervisor and Director of Community Hospital, there was no way to make it work financially. To make a long story short, we sold it to Sutter for thirteen million dollars and the responsibility for indigent care and mental health services went with that. As a sidebar I am chagrined the Board could not keep mental health services as part of the deal when Sutter moved to their current location. Back to Palm Drive, there are four District hospitals in Sonoma County and they all have problems. Small independent hospitals have problems in all over California. Many have closed. Have you asked why? They are the victims of national health policies, big health care plans, and high cost of everything. Equipment gets outdated quickly and cost a zillion bucks. Palm Drive at one point had a census of eight patients prior to closing. No census, no gouging health plans as they all do. Simply put, Palm Drive can't survive this climate as a 24-hour hospital unless they team up with one of the big players. Even then it is debatable. Big players generally don't need the current Palm Drive headaches. Beyond this post, I will have little interest save opposing a tax measure if it is proposed. I supported two and consider that money down the drain. I don't use Palm Drive. I prefer Suttter where I have been a member since they came to Sonoma County. There is no magic, no fantasy reopening, and no more public money. Prove me wrong in the way that matters, come up with a plan that shows financial solvency. I wish you luck. You're going to need it. Last edited by Barry; 01-04-2015 at 10:59 AM. As someone who 'hasn't followed' the Palm Drive situation, you seem to believe you know a lot about the finances. Is this because you have studied them and have a background in hospital finance, or just what you believe to be true from what you've heard? 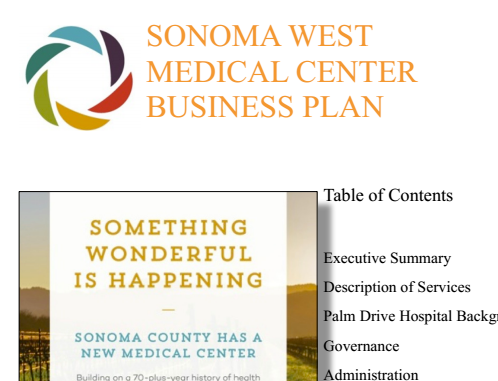 I am emailing you the business plan for Sonoma West Medical Center, which includes 5 year financial pro formas. I assure you that no one is operating under a 'fantasy' and that the plan has been very carefully thought out by hospital administrators, physicians, and hospital CFOs down to the last FTE. No one is going into this with their eyes closed or relying on wishful thinking. We have carefully analyzed the reasons for Palm Drive's failure and built a strategy that will be successful. It is not just more of the same and I hope you will read all of it before you decide that it can't work. You are correct to say that the small hospitals in the area are challenged, but not all are failing. Those that focus on specialty outpatient services are mostly doing very well. Willits is a good example, where the Adventists are also building a brand new hospital at great expense to serve a small community. It seems that they are able to make small hospitals work, we think we can too. There are many other examples as well where private entities take over small hospitals and make them profitable. You will note that the plan anticipates alliances with major local players, something I tried to get the board to do in 2011. This can serve both partners well in an age of the Affordable Care Act. I will also ask Barry to post the plan here for all to see. The populist uprising that elected the Doc and the Cop to form a Palm Drive District Board majority ready to work with the Foundation to reopen our hospital defied the endorsement by just about every political power broker in West County for “we could never again afford an emergency room” Jim Horn. These Jim Horn endorsers included every member of Sebastopol’s purportedly progressive City Council, members of the former Palm Drive District Board majority, political bosses Craig Litwin and Helen Shane (of Sebastopol Tomorrow), and Richard Nichols. Having expended much of their political capital to oppose the Herculean hospital reopening effort underway, and then been trounced by voters who knew better at the polls, our local politicians have since keep pretty quiet about the proposed April reopening of the hospital. So, it seems, the perceived need to respond to my post above exposing the Sonoma West publisher's relentless vendetta against Dan Smith's heroic reopening effort fell to former Supervisor Ernie Carpenter. I am not sure whose future political support Ernie’s comments might appeal to. But to me, they read like a compelling argument never to vote for him again. Ernie goes on to say why he believes failure to be the only option for a hospital with an emergency room at Palm Drive. Unlike Ernie, I did read the article and the financial plan for the hospital. Unlike Ernie, apparently, I have also met with, and interviewed, dozens of people in the community involved with the hospital, with what went wrong in the past, and with what is being done to secure a financially sustainable future. My assessment, based on a far more informed process than Ernie apparently believes necessary, is that the hospital reopening will be a success. And, if this does not prove out in the years to come, it will be a noble effort that will save lives and reduce suffering in the interim. A noble effort which I feel any elected representative or community leader interested in the public interest and health of those in our community should be actively supporting right now, not opposing. So let me get this straight, publisher Rollie Atkinson. A wide majority of We, the People, voting in November, defy all politician endorsers to elect a new Board majority committed to reopening the hospital emergency room that the Board was created to provide, and this constitutes, to the Sonoma West, a "hospital takeover.” Really? “The Board approved a $10,000 “assessment and inspection agreement” to allow an appraisal survey of the property to provide a basic understanding of the state of the building. But Board Member Marsha Sue Lustig said that there should be more clarity about what financial responsibilities the District should have and what SWMC should pay for in its bid to reopen the hospital. She was also concerned that the District might be giving the go-ahead for expensive work on the building when there are no guarantees the SWMC plan will come to fruition. So the former Palm Drive Hospital District Board Chair Marsha Sue Lustig, who just presided over wasteful one time closing costs of more than $3 million, is complaining of a $10,000 bill to assess what it will take to reopen the hospital. And her comment poses a newsworthy question? But of course the Sonoma West will never report how much money was squandered by the former Board to pay legal and consulting and insurance and other costs for their ill-advised, hasty closed door decision to close the hospital for the first time after 70 years. Here's a fantasy for you, Ernie: someday soon, West Sonoma County will have a local media, and local elected representatives, willing to actively support the public interest, and not their political benefactors and friends. Last edited by Peacetown Jonathan; 01-12-2015 at 10:43 PM. The good people now at work to put Palm Drive Hospital back together again should stop what they're doing. Putting Palm Drive Hospital back together again will only lead to another great fall. What they need to do first is tear down the wall. Palm Drive Hospital will not be saved with a "turnaround” plan; it requires a "leap forward” plan. Early on, during this most-recent fiscal crisis, several hospital supporters called for a "bold, radical” approach and a "sustainable” business model with a long range vision. In fairness, the work to complete the Chapter 9 bankruptcy filing, bringing new financial support aboard and hiring a war-tested "turnaround” expert in CEO Jim Sato are all necessary steps to keeping the hospital and its emergency room doors open. But don't forget that wall. Any strategic planning or "sustainable” business model that does not assume a radically new healthcare universe across our region, state and nation will see a short and financially-troubled life. Since 1999, when the taxpayers of western Sonoma County took ownership of Palm Drive, there has never been a profit or anything close to "sustainable.” With or without an intensive care unit, with or without new financial pledges - and even with an annual parcel tax collection of $3.2 million - you've still got a humpty-dumpty hospital. Now, that's a bold statement and I believe she is right. To make this happen, the king's horses and the king's men of Palm Drive should divide into two armies. 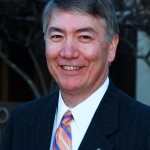 The first should work with CEO Sato and put the hospital back together again on solvent footing. ("Live to fight another day.”) The second must march out onto the new healthcare horizon where Palm Drive Hospital must re-invent itself. That new horizon must be a place where a universal healthcare plan exists, where for-profit insurance companies don't call all the shots and where doctors, patients and their employers are accountable to one another for the overall wellness of the community. In other words, imagine the healthcare future you desire and start acting accordingly. - Work should continue rapidly on coordination of care, systems, recruitment, legislative action and new models with Healdsburg District, Sonoma Valley and the community clinics of Sonoma County. - A "Wellness Brigade” of integrative caregivers, specialists, patients, business owners and others should be given total access to Palm Drive's possibilities. Palm Drive must become a place you go to stay healthy, not just when you are terribly sick. Cannabis Club, Elephant Pharmacy, Health & Fitness Club, elder-hostel, pre-school program, a whole-health cafeteria? Why not? And, what else? - A West County "Employer/Employee Group” is necessary. Employers pay the most private healthcare dollars in the market, yet they have no clout. More united, they can better support Palm Drive while negotiating better insurance rates and reimbursements. Kaiser should not be the only "affordable” option. Patients must make better lifestyle, wellness and economic choices. Atkinson's views would be more worth taking seriously if he had previously demonstrated the respect for his readers and personal integrity required to publish a correction for the inaccurate reporting he gave about the hospital - as Peacetown Jonathan discussed in this thread earlier. When issues are complex one thing we non-experts have to go on is the personal integrity of the various parties involved. Something that is coming pretty clear to me concerning the Palm Drive discussion is just how many personal vendettas and maybe other agendas are hidden within the language of policy analysis. I have avoided weighing in on Palm Drive publicly, because it is not my 1st priority medically. i want to change the expensive over billing for services, drugs, bloated management, unneeded paperwork, put medical decisions in the hands of drs., reduce dramatically role of insurance cos, and obsessive paperwork, (one receives at least 3 hospital "this is not a bill" to get to the actual bill) share drug research costs with lst world nations, and have prevention be foremost in health care, with a critical eye for the unbalanced expenses for end of life care. (These are often unneeded surgeries & hospital time to protect a hospital from law suits, or sometimes culturally driven by families who value every breath, independent of a family members wishes for a life of quality). i see no options for those of us who want the right to choose "a good death". (i advocated on a regular basis for my vibrant, funny, life loving and clear headed dad's health care for 4 years--right up to the moment when he was brain dead & my sister and i made the decision in a difficult hour to "pull the plug" when he was 85. Have advocated for a dear family friend, who lived to 102, and whose life choices were different than mine, but they were hers to choose and support. this headline is misleading and negative. can we step back and stop the no hospital/hospital attack modes and talk about what this community needs and what is possible/realistic? this would mean an end or reduction to the hours discussing Rollie Atkinson & Dan Smith, and looking at what is lacking in Sebastopol, and committed to having an informed discussion about how those needs are best satisfied. my partner has been an amazing, caring physical therapist, whose patients, were home bound, and primarily in the last stages of life. i have seen her transform from "loving her job" until 3 years ago, when the increased time in paper work (which has grown exponentially over the last 20 years) to resenting having to donate/or "steal time" to provide good patient care. sadly she would have stayed longer as a wonderful physical therapist, but the extensive computer/paperwork, and poor decisions in the name of cost cutting measures, meant her work was a daily fight with administration for doing a job that was as more about computer time, and decreased patient time, often framed as cost saving measures, that rarely were. we have talked extensively about Palm drive, it seems that the conversations have been lacking in terms of what are goals we want to accomplish medically. how would the "palm drive money" best be spent? One of my dearest and smartest medical friends (nurse in 5 different capacities over 40+ year career, last 15-20 years heading up infectious disease protocols for ny city hospitals, has recently retired) also disheartened with the current state of medicine in this country, visits us at least twice a year. on her last visit she asked about all the signs. she suggested that most life saving occurs in the ambulance. When i have asked "hosptial re.opening advocates" what they want, when quieried the answers have consistently been the best opportunity to have their life saved. i only read occasional posts now, they are more painful than the bike path discussions, little listening, lots of posturing & blasts. one of my nurse friends, employed by palm drive for years in an on call capacity, along with her current career as a surgical nurse for memorial, said Healdsburg has created a successful community hospital, so it can be done. As a mom of a special needs child who weekly, along with his friends, painfully reminds me the largest inadequacy in our medical system, is the lack of mental health services. (one could make the case that this is where those who want to reduce gun violence might look as well). i would love to see the Sebastopol West County clinic, with a great physchiatrist (very hard to come by) and a two month wait for one's lst appointment with her/or any physchiatrist at the clinic, to be sufficiently funded. With my children and their friends i know the importance of this clinic, along with the Forestville one, in serving youth, and addressing prevention, and how woefully they are underfunded--add the Occidental clinic here as well. please ask yourself before posting/commenting, if you are constructively asking/answering questions that will dramatically improve health care/hospital services for our community. In the act of re.opening, or not, these are the questions that need addressing. one then can find cost effective methods to accomplish these goals. have a blessed day, and a healthy, joyful year. Responding to ICCSoma's post above, the gist of which is his/her comment"
can we step back and stop the no hospital/hospital attack modes and talk about what this community needs and what is possible/realistic? We can only do this if we accept the proposition (as you, in your post, seem to have) that we do not need an emergency room in our community any longer. Speaking on behalf of thousands of like minded parents with children, as well as our elderly neighbors, I do not accept the absence of this most vital of life saving public services as a "new normal." For 70 years, an emergency room in West County--NOT an urgent care facility--has saved hundreds of lives. These were members of our community, loved by their families, who would have died if those who came before us had decided that it was not "possible," or "realistic," to support an emergency room. I welcome a dialog about the future of health care. I am heartened to read that the new Sonoma West Medical center will include an "Integrative Medicine" approach that includes wholesome organic food, and alternative therapies like acupuncture. And I do not want to spend my last days on earth in a hospital any more than you do. But when I, or my neighbor, has a stroke, or my children have a sudden emergency, I, like tens of thousands of us, want a local, humane emergency room. This, not "attack modes," is what this political debate is about. I applaud the donors, doctors and community leaders who have defied the shameful political establishment of our community, and defied the media "Palm Drive is Dead" proponents like Rollie Atkinson. I applaud those who are working, as I write this, to reopen our hospital this year. This debate is not about politics. It is not about attacking or defending. Last edited by Barry; 01-22-2015 at 01:05 PM. Does West County Need Palm Drive Hospital?